This is not the Alice you were expecting. Or so we are reminded throughout. This is a new Alice, in a new Wonderland, for better, or for worse. Tim Burton’s “Alice in Wonderland” gives you exactly what you’d expect in a Tim Burton film: weirdness, darkness, and madness. Although it misses out on some of the depth of his earlier work, “Alice” shows that this man still understands the concept of the fairytale. Rather than making this “Alice” exactly like the original, Burton decided to give it a little twist. Thirteen years after first discovering Wonderland, Alice (Mia Wasikowska) is curious teen, totally loathing her dull Victorian lifestyle. As she is proposed to, she follows that same white rabbit with the stop watch and falls down that same rabbit hole. She’s back where she’s been before but this time, she can’t remember a thing. While in Wonderland, she meets the very mad Mad Hatter (Johnny Depp), who convinces her to team up with the White Queen (Anne Hathaway) and defeat the evil, reigning Red Queen (Helena Bonham Carter) by slaying the Jabberwocky. To this minute, I still feel split in my thoughts on this film. On the one hand, it was thoroughly entertaining. On the other hand, it’s filled with flaws. My biggest problem with “Alice” was that it felt as if Burton was rushing through the story. Even though Alice has existed for almost 150 years, this is obviously a different Alice than we’ve seen before. It’s apparent that she’s a bored free spirit living in the wrong universe. However, barely any background is given as to how she became this way. I thought one of the stronger aspects of “Where the Wild Things Are” (a film I use as a basis of comparison because they are actually very similar) was that it built up all of Max’s anger and alienation into this alternate world. He earned his rite of passage into the Land of the Wild Things. Alice should’ve waited a bit longer. “Alice in Wonderland” is perhaps the most ambitious experiment in converting a film into 3D. However, this story should’ve been kept in the second dimension. None of the visuals seem to pop out at you in an “Avatar” way. Seriously, that 3D cat food commercial that ran before the movie started used the technology better. A film that isn’t shot in 3D isn’t shot in 3D for a reason. Burton was probably trying to keep his vision two dimensional on purpose. Despite the failed 3D, the set design and cinematography are nothing short of stunning. Burton creates a world that’s been seen so many times before in a surprisingly unique way. He tries to turn Wonderland into his own land. Meanwhile, the lush yet dark photography perfectly matches the film’s tone. I think what this is all leading up to is an unfortunate amount of superficiality. That’s disappointing for a director who’s brought humanity to both a man with scissors for hands (“Edward Scissorhands”) and the guy who directed “Plan 9 from Outer Space” (“Ed Wood”). Burton has always put much effort into the world he creates, but he never abandons the humans that inhabit it. And even here, Burton doesn’t seem to relish the wonders that Wonderland provide. You stare, but don’t gaze, at it. I hope I’m not sounding too negative because overall, “Alice in Wonderland” is a good film, but just not the great one that it could’ve been. “Alice in Wonderland” might give us a new story, and a new Alice, but something about it just doesn’t seem inspired enough. 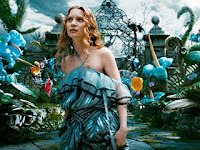 This entry was posted in 3D, Alice in Wonderland, British, Fantasy, Johnny Depp, Mia Wasikowska, Movie Review, Tim Burton on March 6, 2010 by ian0592.